60th years of resistance and resilience among Tibetans in Leh. On the 60th anniversary of Tibetan National Uprising day, Tibetans in Leh observed peaceful march from Tibetan Medical and Astrological Institute of Leh to Polo ground on March 10. Thousand of Tibetans including Tibetan Children Village students gathered to commemorate the solemn occasion which connects their history, memory, culture, resistance and resilience. 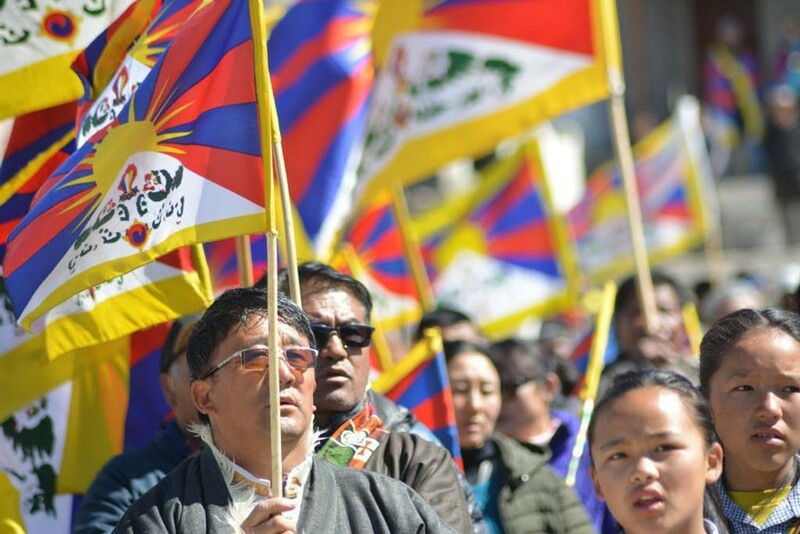 Tibetan National Uprising day is to call to mark the illegal invasion of People Republic of China in Tibet since March 10, 1959. Jamyang Tsering Namgyal, CEC expressed solidarity with Tibetan freedom struggle for peace and non-violence. He also extended solidarity to Tibetans brothers and sisters who sacrificed their lives for the cause of Tibet. Tsetan Wangchuk, Chief Representative Officer, Sonamling Settlement read out the statement of the President of the Central Tibetan Administration, Dharamsala. Similarly, Tsering Wangchuk, Vice President of Local Tibetan Assembly shared the statement of the Tibetan Parliament in Exile, Dharamsala. P.T Kunzang, Vice President, Ladakh Buddhist Association assured to extend every possible support from their end for the welfare of Tibetans in Leh and Tibet cause at a larger scale. Konchok Ishey Stak, President, LBA Youth wing urged Tibetan youths to never forget their roots and struggle their parents/grandparents went through. He further added that need for freedom of expression and press in Tibet is highly crucial as according to Freedom House, Tibet is the least free country in the world under Chinese Communist Party rule. Ven Shedup Chamba, President, Ladakh Gonpa Association gave assurance to continue to stand for Tibet cause as Ladakhi and Tibetan have significant relation in terms of culture, religion and language. Norbu Dorjee, President, Tibetan Freedom Movement requested Tibetans youths to give priority to education to gain Tibet independence. He extended gratitude towards the first generation Tibetans in exile for their struggle and hard work in establishing successful settlements and schools all over India in preserving Tibetan ethnic and cultural identity. Tashi Dhondup a local Tibetan said that the Tibetan government in exile should continue to convene delegations with the Chinese authority to progress Tibetan national struggle.